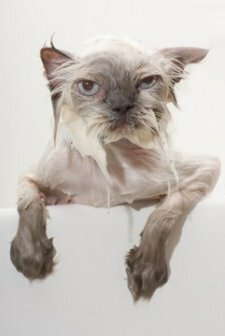 Bathing a cat is not really a good idea because on the whole, cats don't much like water (unless they're Bengals, who positively enjoy splashing around in puddles). Cats have all they need to keep themselves clean, so giving a cat a bath is generally only necessary in extreme circumstances. For example, if they get covered in an oily or toxic substance that they can't remove by themselves, or when they come into contact with something evil-smelling or get invaded by ticks or fleas. You need nerves of steel when bathing a cat. But if you do need to give your cat a bath, here are our instructions. Wear old clothes - jeans and a long-sleeved shirt or sweater to protect your skin from getting scratched. The kitchen is a good place for bathing a cat, especially if you have a double sink. One half can then be used for soaping and the other half for rinsing off. Whether you have a single sink or a double one, if you use the kitchen sink it's a good idea to take a folded towel and lay it on the counter at the edge of the sink, with the open end of the folded towel level with the edge, so that when you've finished, your cat can climb up straight up into the towel. Another idea is to put a large towel at the bottom of the sink to give your cat something to grip onto. Alternatively, you can use the bathroom shower or bath, where you have the added advantage of a shower head for to rinse with. If you decide on the bathroom, one way is to use the bucket method - use two buckets (or large saucepans or similar containers) one for the soapy water, one to rinse. Whichever room you choose, make sure that all breakable items are moved well out of harm's way! Collect together everything you'll need. Sponge or face cloth, specially formulated shampoo for cats, or flea shampoo if you're treating fleas. Don't use human shampoo or soap as these can harm the animal's skin and fur. You'll also need a brush, a comb and several large towels. The water temperature should be the same as the cat's body temperature (102ºF/39ºC), which is higher than our own, so to you the water should feel slightly hotter than luke-warm. If not, to the cat, the water will feel uncomfortably cold. Put a small amount (around a tablespoonful) of shampoo into your first container. Add water and mix well – you need enough water to partly cover your pet, but don't overfill your container, because cats don't like having their faces splashed. Fill the second container with clean warm water. Bring in your victim dearly beloved faithful companion. Lower him gently into the first container. Once in, use one hand to support him and the other to work your way through his fur so that the whole body, apart from the head, gets wet. Add a little more shampoo and work it through the fur all the way up to the neck, then rinse and remove as much of the soapy water as possible with your hands before taking the cat out. Put your cat into the container with the clean water, rinse him well, and again, squeeze away as much water as possible with your hands. You may need to rinse more than once. Rinse, rinse and rinse again if necessary, as it's very important to get all the shampoo out of the cat's coat to avoid leaving him with skin problems. Don't leave your cat with wet fur. Wrap him securely in a towel but avoid covering his face as this may frighten him. Towel his fur in every direction and if necessary use further towels to get him as dry as possible before releasing him. He'll probably lick himself all over, which will help to dry him off. If you have a long-haired cat, brush its fur gently to remove any knots and tangles, and finish by combing through. I occasionally link to books and products I think you might like. If you purchase through one of these links, I receive a small commission. There's no extra cost to you, and I only suggest products that I have enjoyed or that other cat owners have recommended. You can find out more on our Affiliates Disclosure page.